Please check the “Ringer/Mute” Switch (marked as “1”, see the left image below) in the iPhone to make sure that the iPhone ringer is ON. 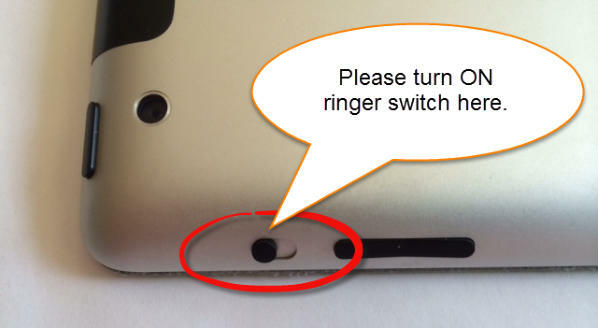 For the iPAD, make sure that the iPAD is NOT muted (Ringer Switch is ON, see the right image below). Different from media playback (such as music, podcasts, videos, and TV shows), Sounds in i-Angel Sound will NOT play if iPAD is muted (Ringer Siwtch is OFF and Side Switch is used to Mute). 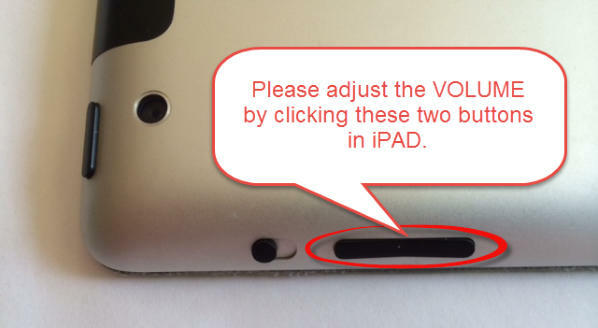 Please modify the Volume Control (marked as “7” in the left image below for the iphone and the red cricle shown below for the iPAD) to adjust the Volume. When you click the button, a volume indicator (”Sound Effects”) will appear in the screen (see the bottom image below).